I was reading the local paper yesterday and was saddened to see a funeral notice for a fellow trail rider whom I’ve known casually over the years. I met Diana and her husband, Tim, years ago at Rock Creek Station. Not much older than me, we shared a passion for the trails and loved to spend hours on our horse. Although we didn’t ride together, she, too, had wanderlust for finding new trails. Occasionally Tim would send an email telling me of their most recent trip and sharing their pictures from that adventure. A couple years ago, his email was simply a request for prayers; Diana had been diagnosed with cancer and would be undergoing treatment. In the months following, we would run into each other occasionally at other horse events. No doubt going through their own hell, they always stopped to chat and were gracious with their time. We’d talk about our horses and plans for the upcoming season; hopeful her most recent treatments would answer their prayers. Perhaps guardedly optimistic, there was never a question if Diana would ride again. With God’s blessing, she would when she could. I thought about Diana on my ride last night. The wind had quieted, the sun was setting and its light through the trees was refreshing and warm. I’d caught a whiff of wildflower mixed with the scent of the horse. As I listened to the sounds of dried leaves and rock under the hooves of our horses, I knew, without a doubt, Diana was riding again. Happy trails forever, my friend. awww, I'm so sorry. Yes, I'm sure she is cantering through green valleys right now. You captured the essence of faith~ I too, am comforted with your sights and smells, knowing that Diana has the best trails now! What a beautiful, touching nd heartfelt tribute to your dear friend. 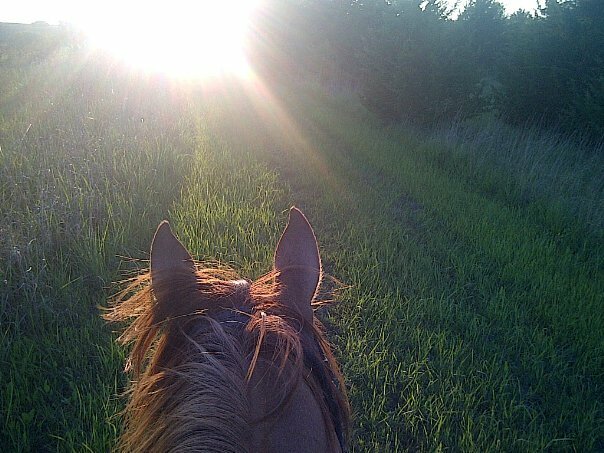 I'm so sorry for your loss, but I don't doubt that you will feel her spirit riding along with you out on the trails. I am sure she is riding...pain free. So sorry for your loss.